This USA Love List Source List is a long one, and I am sure it will be getting longer! Kitchenware is a category that covers any tools, utensils, appliances, dishes, and cookware, that can be used in the process of preparing and serving food. Everyone has and needs kitchenware items. The next time you are ready to replace your cookware, bakeware or dishes, be sure you check this list first and make that purchase an American made one. 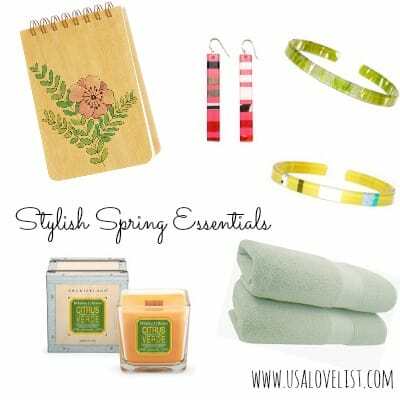 These items also make great gifts! 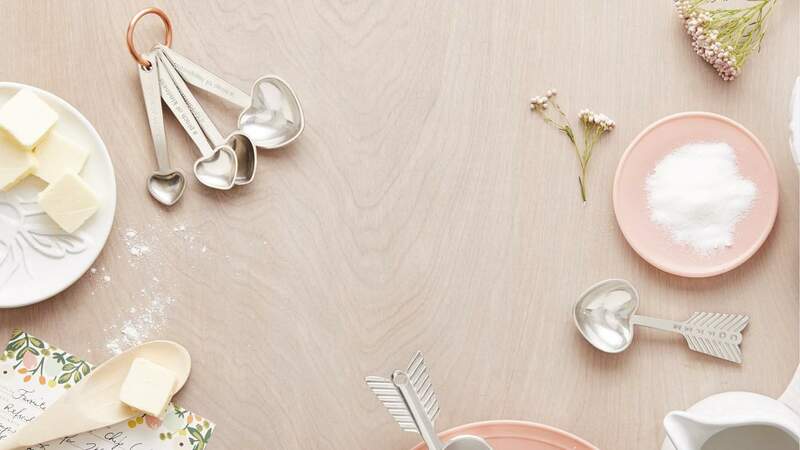 Bookmark this list of made in USA kitchenware so you can easily find it when you need to purchase a wedding, bridal shower, anniversary, birthday or holiday gift. Create healthier meals for you and your loved ones using made in America 360 Cookware bakeware & cookware. What makes food cooked in 360 Cookware healthier, you ask? 360 Cookware does not use any harsh chemicals- no non-stick coatings and other harsh chemicals- in the making of their cookware and bakeware, so there is no leaching of toxins into your food. 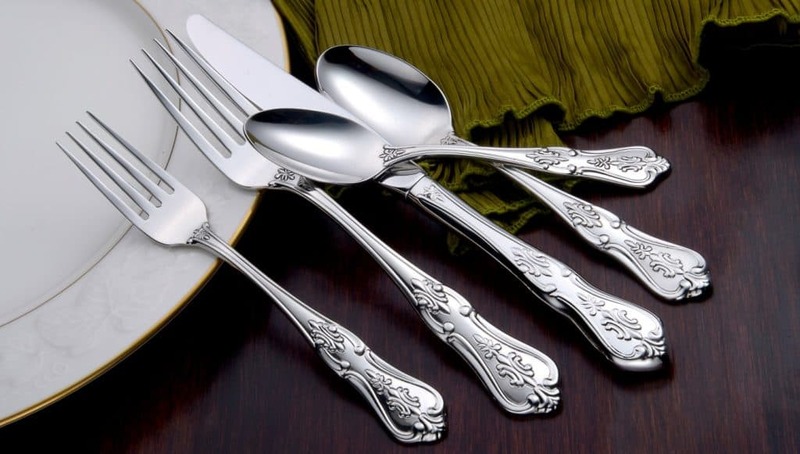 Manufactured in New York by Sherrill Manufacturing, Liberty Tabletop is the only silverware made solely in the USA. 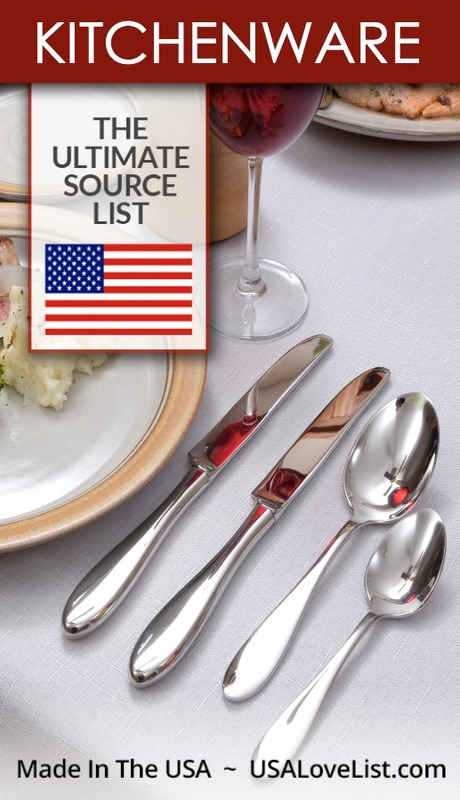 Liberty Tabletop made in USA stainless steel flatware is made from domestically sourced steel that is 8 to 10 percent nickel and 16 to 18 percent chromium. Unlike stainless steel in foreign flatware manufacturing, Liberty Tabletop guarantees that the metal mix in their stainless steel does NOT contain lead, mercury, or any other toxic metals that we don’t want in our mouths. 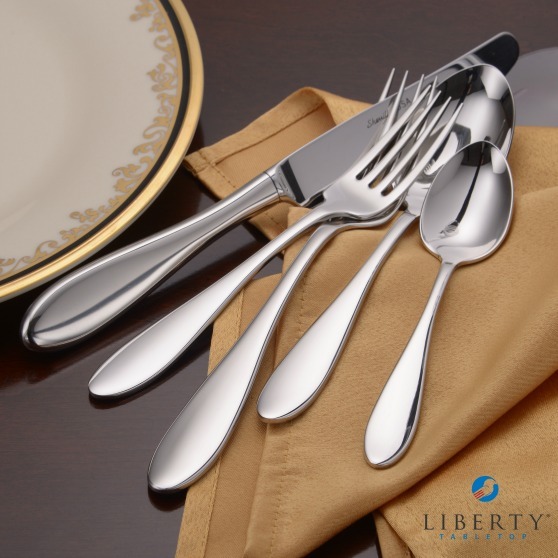 Liberty Tabletop flatware is available in a variety of patterns and is sure to be used for generations. Beehive Handmade unique made in USA kitchenware items are more than just cooking tools. 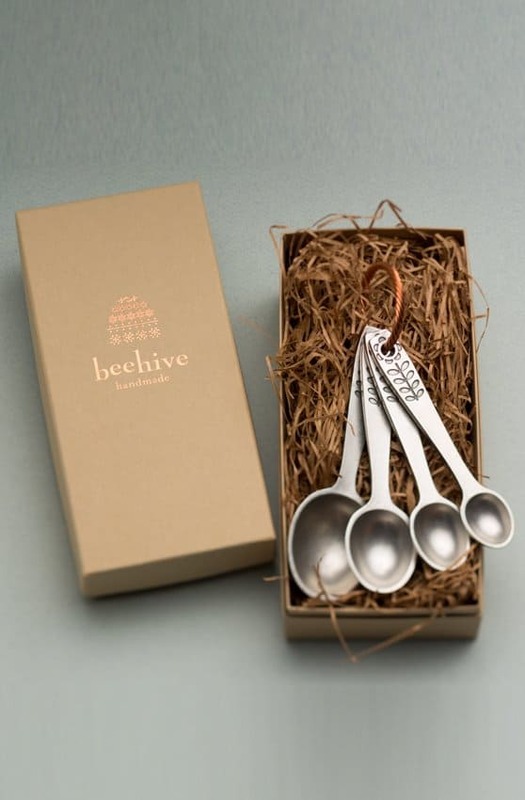 Beehive Handmade's beautiful kitchen gadgets and utensils are crafted to hold a special meaning to those who give and to those who receive them. These heirloom quality measuring spoons, serving utensils, scoops, cheese markers, and more are sure to be passed down through generations. All Beehive Handmade products are made in Rhode Island from lead free pewter alloy that is tested safe for food. 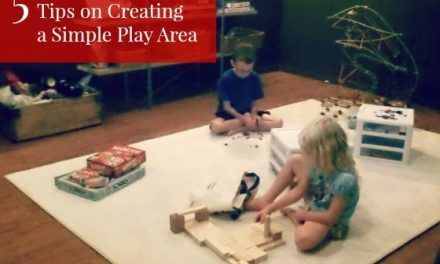 Even their product boxes and packing materials are made in the USA (also in Rhode Island). Made in USA Kitchenware Deal: Save 10% on your Beehive Handmade order with promo code USALOVE. Offer valid 5/1/18-5/1/19. 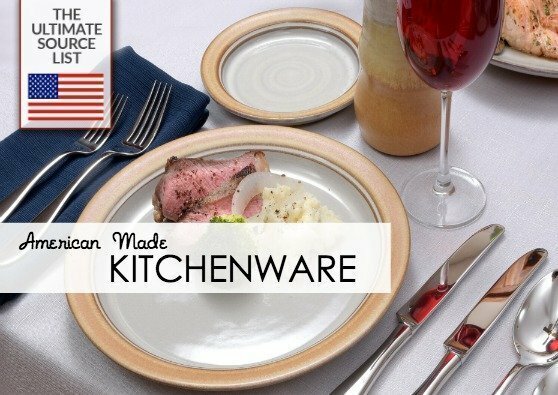 If we missed your favorite made in USA kitchenware manufacturer, let us know in the comments. This list is frequently updated. 1919 Cookware Collection was specially designed for home chefs to have quality kitchens tools on hand to enhance the cooking experience. 1919 Cookware can also be found at Bed, Bath and Beyond. 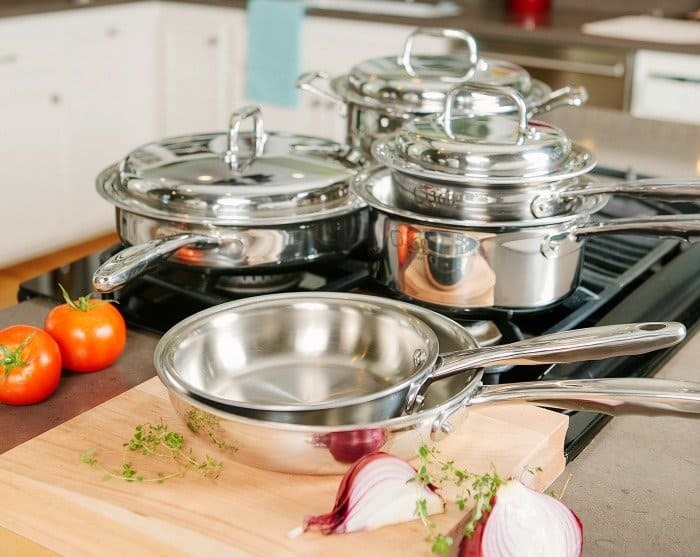 Save 10% off 1919 Cookware with code USALOVE. Baking Steel stainless steel pizza stone and griddle made in Massachusetts. SeaGlass recycled glass dishware is made in the USA and available at Vivaterra. Liberty Tabletop high quality stainless steel flatware is made in New York Learn more about Liberty Tabletop American made flatware at the top of this post! The Great Alaskan Bowl Company wooden serving and soup bowls are handmade in Alaska. Don't miss our source list of made in USA kitchen appliances and household appliances. Blendtec blenders are made in Utah Get Jill's Vegan Gluten Free Breakfast Cereal (made with a Blendtec) recipe here. Champion Juicer commercial and home use juicers, made in California Learn how my family uses the Champion juicer to make apple cider here. Vitamix high performance blenders are manufactured in the USA. Ann Clark Ltd cookie cutters come in all shapes and sizes and are made in Vermont See how my kiddo's and I make Halloween cookies with Ann Clark cookie cutters here. Beehive Handmade kitchen gadgets- measuring cups, serving utensils, and more, made in Rhode Island Learn more about Beehive Handmade heirloom quality kitchenware products at the top of this article. 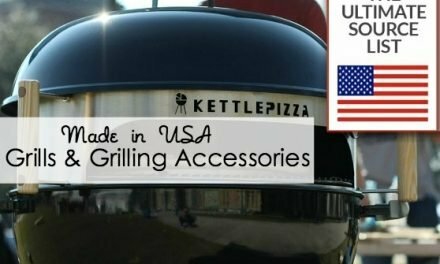 Made in USA Kitchenware Deal: Save 10% on your Beehive Handmade order with promo code USALOVE Offer valid 5/1/18-5/1/19. Warther Cutlery knives have been hand crafted in Ohio for over 100 years. Zeroll Co. manufactures sever lines of ice cream scoops in Florida. Vivaterra offers a selection of American made Eco friendly kitchenware products including dishware, and servingware. Sur La Table has a large selection of made in USA bakeware, dishware, kitchen gadgets, and more. Joss & Main has a large selection of made in USA items including dishware, wine and champagne glasses and kitchen gadgets. This looks like an awesome list of kitchenware made in the USA. This is an amazing list! It must have taken a while to compile – wow!!! I’m happily surprised to see how many companies have these products made in USA. This is where I need to stock up for tableware for the holidays! I love cookware/kitchenware of all sorts, so thanks for this list! I’ll be checking them out. I didn’t know there was any silverware still made in the USA. I’ll have to check them out. Does Snapware count as kitchenware? I don’t see it on this list, but I have a set of Snapware from Costco that is made in USA. I love what you have done. I do have a problem that each link seems to take me to Amazon. Amazon sells knock-offs so I copy and pasted the name in a new search to find that companies own website. That way you know that an item was truly made by them. Don’t forget RADA CUTLERY! Made in the USA, great price, great quality! So many brands I’ll have to look for next time we need a piece for the kitchen. I didn’t know about the lead in some stainless steel. I didn’t see Hammer Stahl listed under cookware – they manufacture stainless steel cookware in Clarksville, TN sold on their website and Amazon. They use 316ti stainless, versus the more typical 304, in order to achieve what they say is “the most inert, stable, and hypoallergenic cooking surface available.” They provide a lot of additional info on their site to support why to choose their brand. https://www.heritagesteel.us/about.html I was searching for new safe and healthy cookware to buy and they came across my radar. Graniteware – made in Terre Haute, IN – “speckled” enamel-coated cookware/bakeware, plus some dishware. These kitchenware is just fantastic and thank you sharing this blog. This is a wonderful list. Remember that for any manufacturing to be done in the USA we the people need to support it! That many time means that the process takes effort. 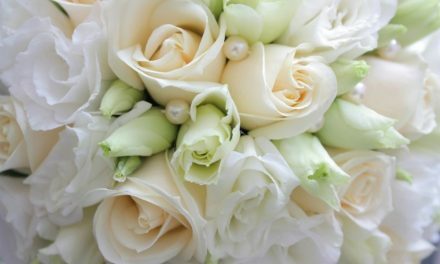 You/we have to search and be patient and not buy the first thing we see on the shelf or on a web site. We also must ask for those made in the USA products when we shop local. God bless the USA and it’s people. I have a question? I was looking for flatware made in the USA and was very happy to find Liberty. But I noticed most of their flatware lines are stamped SMI USA. I looked it up and SMI USA is a Chinese investment firm, Shanghai Chengtou USA. Can anyone tell me more about what that means about Liberty as a US company and the materials they are possibly using, etc? I noticed they had prices on some their flatware that was fairly reasonable, are the materials coming from China, etc? The flatware that says Sherrill 18/10 USA on it is more expensive. In researching this further I am guessing that SMI in this case refers to Sherrill Manufacturing Incorporated and not the Chinese firm SMI.